Muscular dystrophy is a condition in which muscles, month by month and year by year, get weaker and weaker. Because thedisability gradually gets worse, we say it is 'progressive'. Mostly affects boys (rarely girls). Often brothers or male relatives have same problem. First signs appear around ages 3 to 5: the child may seem awkward or clumsy, or he begins to walk 'tiptoe' because he cannot put his feet flat. Runs strangely. Falls often. Problem gets steadily worse over the next several years. Muscle weakness first affects feet, fronts of thighs, hips, belly, shoulders, and elbows. Later, it affects hands, face, and neck muscles. Most children become unable to walk by age 10. May develop a severe curve of the spine. Heart and breathing muscles also get weak. Child usually dies before age 20 from heart failure or pneumonia. To get up from the ground, the child 'walks up' his thighs with his hands. This is mainly because of weak thigh muscles. How common is it? It is not very common. Rehabilitation centers may see one child with muscular dystrophy for every 30 or 40 with cerebral palsy or polio. What causes it? Nobody knows. But in 2 out of 3 families with muscular dystrophy, there is a history of it among male relatives of the mother. Though the parents are usually normal, the mother carries the 'gene' that produces dystrophy in her sons. Her daughters will develop normally, but they may have sons with muscular dystrophy. What treatment is there? None. No medicines help. Special therapy or exercises will not stop the weakness from increasing. Surgery to release tiptoe contractures is at best of temporary benefit. The family can, however, do much to help the child make the best of his life and adapt to his limitations as they progress. Also, activities, exercises and braces to prevent contractures may help the child to keep walking longer (see Page 111). If the child sits in a bad position, pillows or supports to help him sit straighter can help prevent deformities. Is the child's mind affected? About half of these children are somewhat mentally retarded (slow learners); some are very intelligent. What can be done? The family can do many things to help the child live more fully and happily. The child should remain active and continue normal activities for as long as possible. Play with other children is important. So are learning and exploring. The child should go to school. Encourage other children to help him with learning and play. The teacher should realize that some-but not all-children with dystrophy learn a little more slowly than normal. Try to include the child in as many family and community activities as possible. The steadily increasing weakness and the lack of effective treatment will be hard for both the family and child to accept. Friendly assistance, advice, and encouragement from health workers and friends can be a big help. Help the family to look at the situation honestly, and to do their best. The goal of the family is to help the child be as active and happy as possible, and to adjust to his increasing limitations. Exercise. To keep as strong as possible and prevent contractures, probably the best therapy, at least at first, is to stay active, to walk, run, and play. While range-of-motion and stretching exercises may help (see Chapter 42), it is even better to involve the child in games, work, and other activities that keep his joints flexible. Even though he is slow and awkward, encourage him to take part. Feeling sorry for him and just letting him sit is the worst thing you can do. If contractures of the knees and hips begin to develop, try resting or sleeping with 'sand bags' to press down the legs and help straighten them. CAUTION: Balance your efforts to provide therapy or surgery against the need of the child (and his family) to lead as full, happy, and normal a life as possible. His weakness will increase and his life will be short regardless of all efforts. The goal of all care for the child with muscular dystrophy should be to help him get the most out of living NOW. The temporary benefits of surgery should be weighed against the pain and hardships it would involve. Other aids. The child will reach a point where he needs to use crutches. Later, (often by age 10) he will not be able to walk. Do not force him when it becomes too hard. Instead, try to obtain or make awheelchair. (See Chapters 64 to 66.) At first, the child may be able to roll it himself. But as his weakness progresses, he may need to be pushed. Breathing deeply is important, especially when the muscles that move the lungs begin to weaken. Encourage the child to sing loudly, to shout, to blow whistles, and to blow up balloons. Getting fat is a common problem in children with dystrophy. The child needs to eat a healthy balanced diet. But take care not to let him eat too much - especially sweet things. Extra body weight will make walking, breathing, and other activities more difficult for his weakening body, and will make it harder for family members to lift him. Constipation (hard, difficult stools) may become a problem. Drinking lots of liquid helps. So does eating fruits and vegetables, and foods with lots of fiber (see Page 212). Spinal curve can become severe (see picture of Tito drawing, below). A corset or body brace may help hold the child in a straighter position so he can use his arms better and breathe better (see Page 164). Arm weakness in time may become a problem for self-care and eating. You can make a simple aid to help get the hand to the mouth. More ideas of aids for eating and reaching are on Page 330 and 331. It is important to help the child gain interests and skills that he can continue to develop even as he becomes very weak. He should stay in school, if possible, even when he has to go in a wheelchair. Learning to draw and paint can be fulfilling. 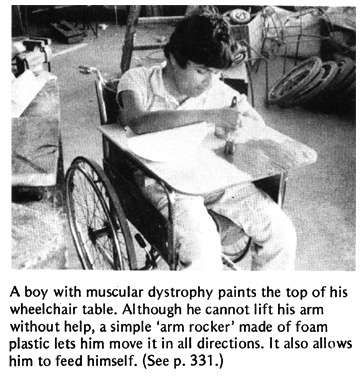 In Los Pargos, an organization of families of disabled children in Mexico (see Page 517), 4 brothers with muscular dystrophy have all become very good artists. Their paintings have won prizes in contests and are sold to raise money for the group. The best artist of all was the oldest brother, Tito. He took pride in his paintings and enjoyed teaching the other children. He did one of his best paintings, a sea turtle with wings, a week before he died, at age 17. PREVENTION: The only way to prevent muscular dystrophy is for women who may have the dystrophy gene not to have children. This mostly means sisters of affected boys and close relatives on the mother's side. If you have one son with dystrophy, other sons will be likely to have it too. You might consider not having more children. The type of dystrophy just described-also called progressive, pseudohypertrophic, or Duchenne's muscular dystrophy-is the most common. But there are many different types of muscular dystrophy and muscular atrophy. All start little by little: some in early childhood, some between ages 13 to 19, and some in adults. All steadily get worse and worse. Some types, however, almost stop after a certain age, and the person may live to active old age, although handicapped.